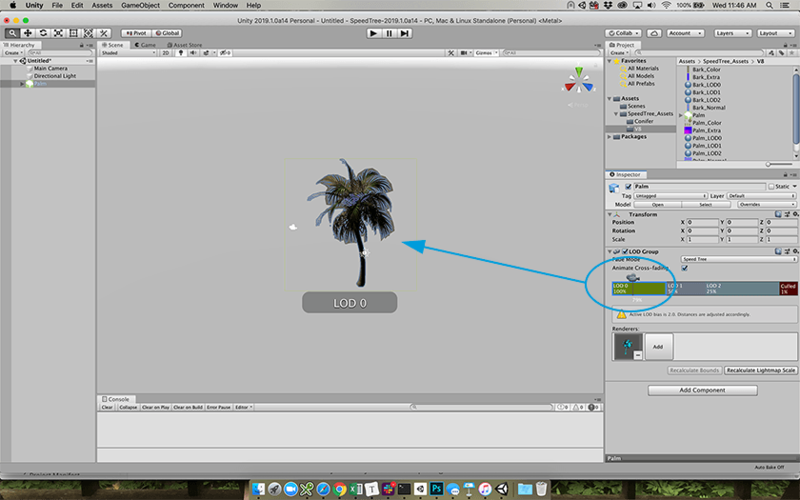 The LOD Group component manages level of detail (LOD) for GameObjects. Click Recalculate Bounds to recalculate the bounding volume of all LOD Mesh GameObjects after a new LOD level is added. 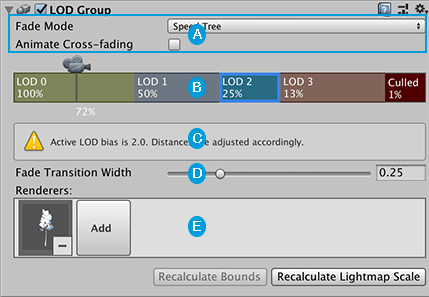 Click Recalculate Lightmap Scale to update the Scale in Lightmap property on all LOD Mesh Renderers, based on the changes you made to the LOD level boundaries. The percentage that appears in each LOD level box represents the threshold at which that level becomes active, based on the ratio of the GameObject’s screen space height to the total screen height. For example, if the threshold for LOD 1 is set to 50%, then LOD 1 becomes active when the camera pulls back far enough that the GameObject’s height fills half of the view. The Scene view displays a preview of the transitions between LOD levels when you move the camera icon on the LOD Group selection bar. The camera icon acts like a playhead which you can use to scrub back and forth to control the exact position to preview along the LOD Group selection bar. The preview shows what the Camera will render at each LOD level. 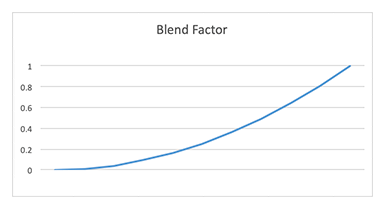 Unity calculates a blend factor from the GameObject’s screen size and passes it to your shader in the unity_LODFade.x uniform variable. Depending on the Fade Mode you choose, use either the LOD_FADE_PERCENTAGE or LOD_FADE_CROSSFADE keyword for GameObjects rendered with LOD fading.